According to a study by Bersin by Deloitte, it takes an average of 52 days to fill an open position and costs about $4,000 to interview, schedule and assess each candidate. At the end of the day, that adds up. Now, Hire–an app designed to help small and medium businesses recruit more effectively–can help. Schedule interviews in Hire with visibility into an interviewer's schedule from Calendar. Hire also automatically includes important details in Calendar invites, like contact information, the full interview schedule and what questions each interviewer should focus on. Brad’s Deals is a free service that compares online prices to help consumers find the best deals. As a growing organization, recruiting is a top priority for the company. With more than 260 active candidates in their pipeline, Brad’s Deals uses Hire to share candidate information, capture feedback from the interviewing team in one place and track interview progress. 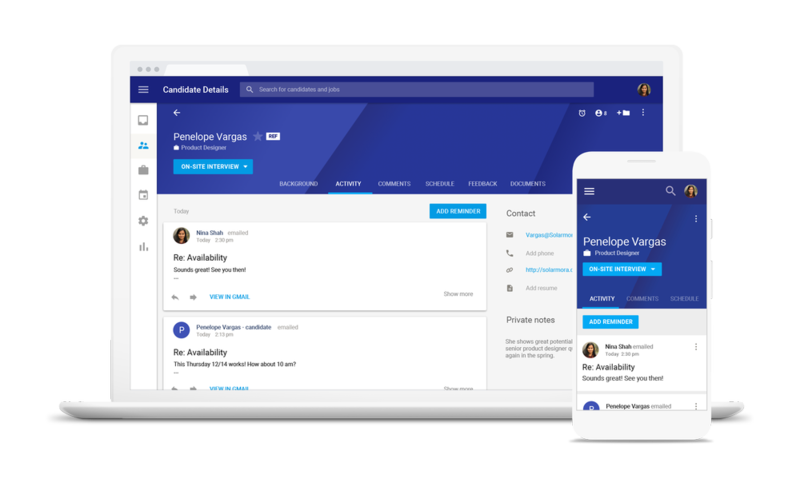 Hire is the latest product offering from Google to address the talent marketplace. In May, we unveiled Google for Jobs, our initiative that's focused on helping both job seekers and employers, across our products and through deep collaboration with the job matching industry. Google Search connects jobseekers to job opportunities from the open and broad ecosystem of providers, including employer listings as well as LinkedIn, Monster, WayUp, DirectEmployers, CareerBuilder, Glassdoor and Facebook. Hire addresses the needs of our G Suite customers—making it easier to hire the right people. Now, all U.S.-based businesses under 1,000 employees that use G Suite can purchase Hire to land the best talent. To learn more, visit http://hire.google.com or request a demo at http://hire.google.com/request-demo/. Available for purchase by G Suite Basic, Business, and Enterprise edition domains in the US with fewer than 1,000 G Suite seats. Hire is not a core G Suite service.